Happy birthday T. Ernesto Bethancourt (The Dog Days of Arthur Cane) and Jeanne Betancourt (My Name is Brain Brian; Pony Pal series). It’s the birth date of Dirk Zimmer (1943-2008), In a Dark, Dark Room and Other Scary Stories. In 1950, the first Peanuts comic strip runs in nine newspapers. Read How to Draw Peanuts by Charles Schultz, and Peanuts: The Art of Charles Schultz. Thurgood Marshall was sworn in as first African-American Supreme Court justice on this day in 1967. Read A Picture Book of Thurgood Marshall by David A. Adler, illustrated by Robert Casilla. It’s Name Your Car Day. Read The Old Woman Who Named Things by Cynthia Rylant, illustrated by Kathryn Brown. It’s Phileas Fogg’s Wager Day. Read Around the World in Eighty Days by Jules Verne. October 2, 1968 marks the establishment of California’s Redwood National Park, which protects slightly less than half of the remaining coast redwoods. Unfortunately, I have never personally seen one of these beauties, but hearing about the raging fires in Yosemite National Park in August and September led me to return to one of my favorite picture books of the last five years, Jason Chin’s Redwoods. Chin had also never seen Redwood, but was inspired by Richard Preston’s The Wild Trees, which described climbing in the canopy of these trees. A dedicated researcher, Chin sketched out his ideas for the book and then headed to California to “experience the wonder and majesty of the redwood forests.” As he worked on site, the perspective of his drawings changed; his pieces began to convey the feeling of being in Redwood National Park. As a young city boy reads about redwoods on the subway in Chin’s book, he imagines the dinosaurs of the Jurassic period that roamed the Earth alongside the ancestors of the current trees. A Roman soldier sits next to him as he learns that some of the living trees first sprouted during the Roman Empire. Then, while leaving the subway, he imagines himself in a redwood forest. As he walks through the forest, he learns many exciting things about redwoods, such as the fact that that cars can drive through the trees and that they can resist fire. As young readers get treated to a basic science lesson, they also experience the fantasy of walking in a redwood forest. Finally, our hero catapults himself into a tree, using a bow-and-arrow line. 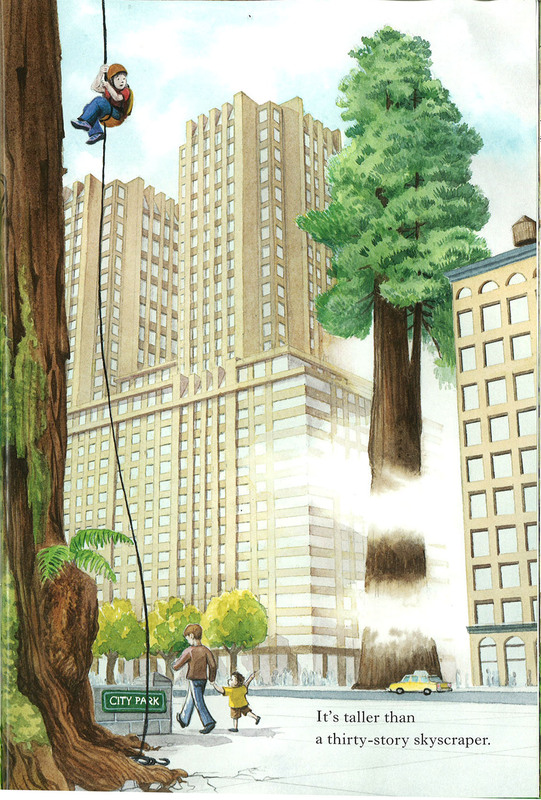 After he discovers that the redwoods are taller than a thirty-story skyscraper, the young boy returns to his real life in New York City. But he leaves the book on the bench, and now another reader can enter the magical redwood forest. Information has rarely been delivered in a picture book in such an exciting form. 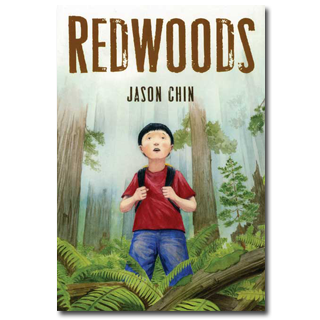 Chin possesses a superb ability to make complicated facts understandable to young readers, and also sends readers on a search for more information about redwoods. In Redwoods Jason Chin uses the form of the picture information book, brilliantly blends fiction and nonfiction, and captures “the wonder and majesty” of the redwood forest. It is a perfect book to celebrate the establishment of Redwood National Park—or just to enjoy on any day. Originally posted October 2, 2013. Updated for . I was born no too far from these Redwoods. I have always loved the idea that trees are living things, and aware. Muir talked to them. In childhood, I would sit at the base of a large tree with my back to it, for comfort and safety. I have always seen trees as my friends and sentinels, in a way. I have this ordered from the library. Can’t wait.